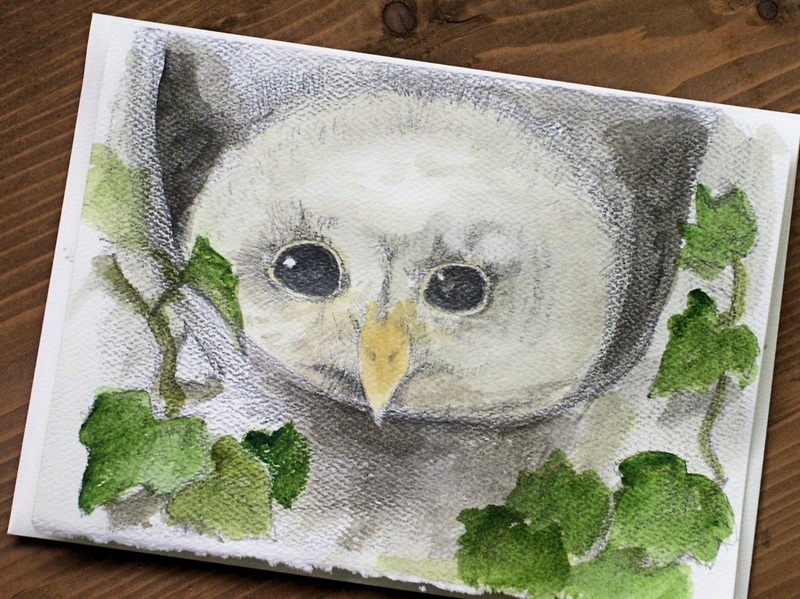 Nature Art woodland bird rendering of a baby owl watercolor original paintings on paper by Laurie Rohner. SOLD Nature art watercolor graphite painting is an original art work of a woodland bird titled Woodland Baby Owl by Laurie Rohner. Where I live there are birds all around and I love birds. They are inquisitive like me and have a clear distinct voices or song which always brightens a day. This woodland bird is checking out the world from his hole in the tree. The world must look so scary. There is ivy hiding this little baby owl from those who will hurt him. This is a graphite and watercolor painting. 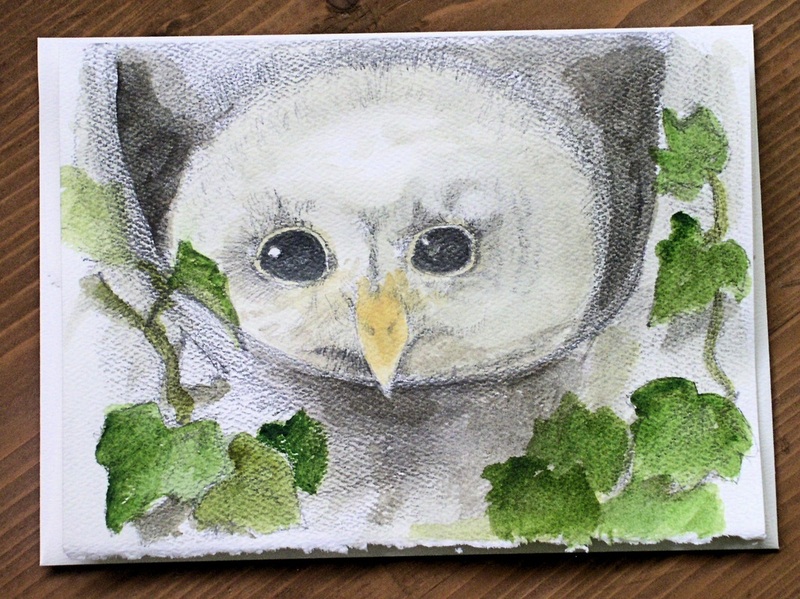 Buy art, original watercolor nature art card, inspired by autumn and nature, use as wall art. 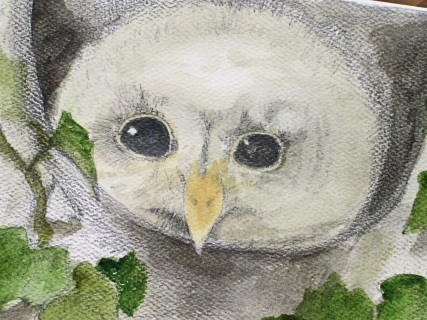 Original art for sale online here at Laurie Rohner Studio. You will love my individually hand-painted art cards. Great for gift giving. Can be framed later. This is an original watercolor painting not a print or reproduction. 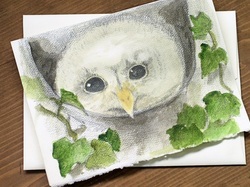 I combine drawing with pencil and watercolor painting. Medium: Windsor and Newton Artist Quality Watercolors on 140lb Strathmore card with deckled edges on card and envelope. .
Blank inside, each original art card comes with an envelope. Sale includes the one signed art card only - additional cards, frame, mat etc. are not included in sale. My nature art cards are original one-of-a-kind paintings that are suitable for framing. The card you will receive is very similar to the ones shown in this listing but may have some variations as each card is hand-painted and has it's own unique and individual qualities. All of my watercolors are made with the finest archival quality materials - Strathmore Watercolor Paper and Windsor and Newton Artists Quality Watercolors - and professionally packaged to arrive safely. Windsor and Newton Artist Quality Watercolors are renowned for their superior color permanence, balance and amazing color range. All my art cards including this artwork are original miniature watercolors suitable for framing, enjoy them in your home or send as a unique gift to that special someone. ​(c)2000 -2019 Laurie Rohner Studio. All Trademarks and Rights Reserved.